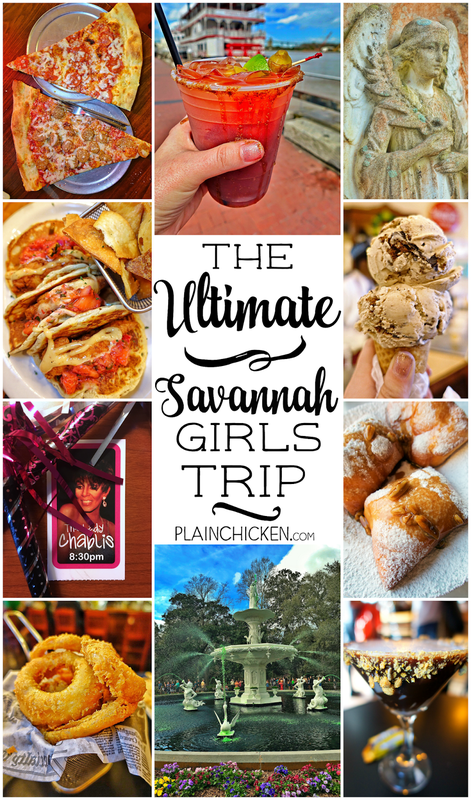 I just got back from an amazing girls trip to Savannah. I went with my friend, Karen. Karen hadn't been to Savannah in a really long time. I was excited to show her all of my favorite places and also give some new places a try. 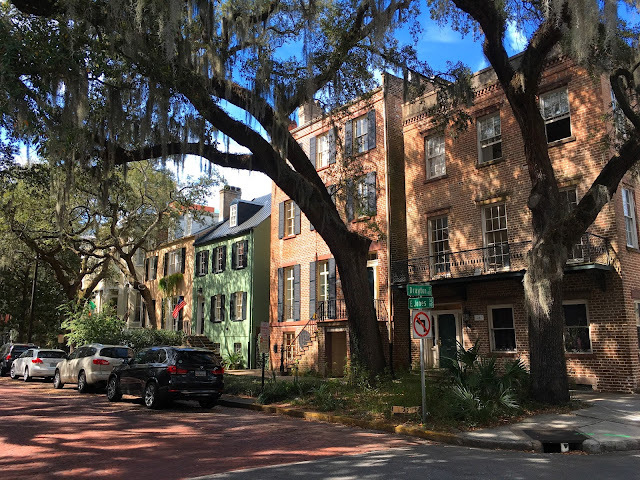 We ate and drank our way around Savannah for two days. We saw the sites and had a blast!! We are already planning our next trip back!! 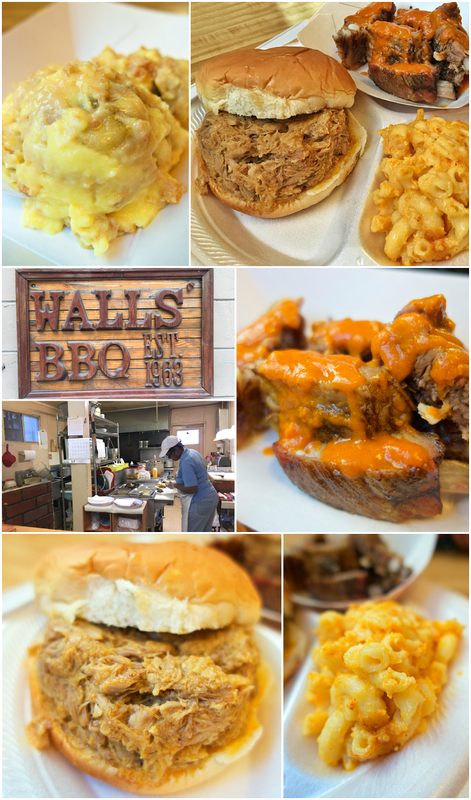 Our first stop after checking into the hotel was Wall's BBQ. Wall's BBQ definitely falls into the "dive" category. It had great reviews on Yelp and TripAdvisor, so I was excited to give it a try. We sampled the Pork Sandwich, Ribs, Mac & Cheese and Banana Pudding. It was all great. I think our favorite was the pork sandwich. They take credit cards, but you have to tip the waiter with cash. 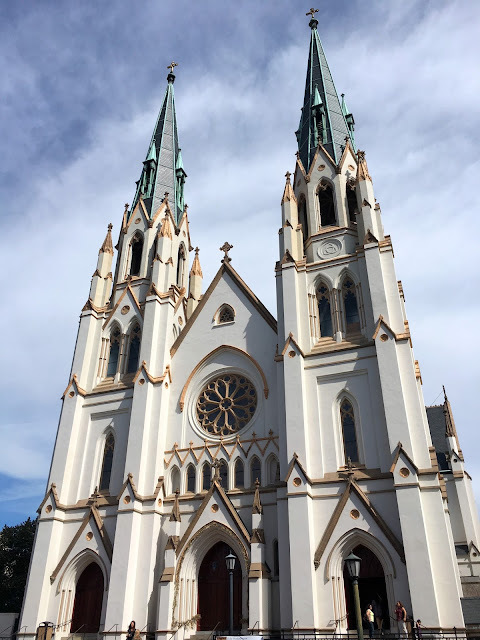 The tour cost about $13 and lasts about 30 minutes. You only get to see 4 rooms downstairs. I wish we would have been able to see more of the house! We stopped in at one of my favorite watering holes for a drink and a couple of snacks. 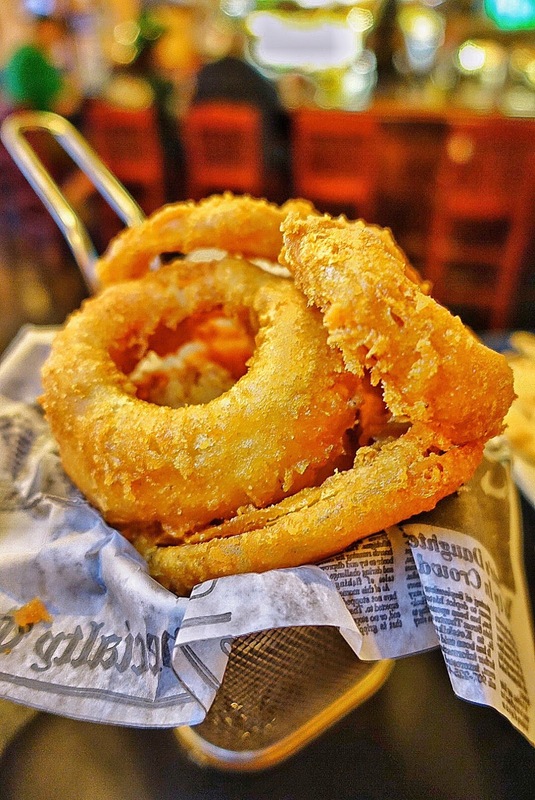 These Guinness Onion Rings were crazy good! So crispy and delicious. They came with a remoulade sauce - so delicious! 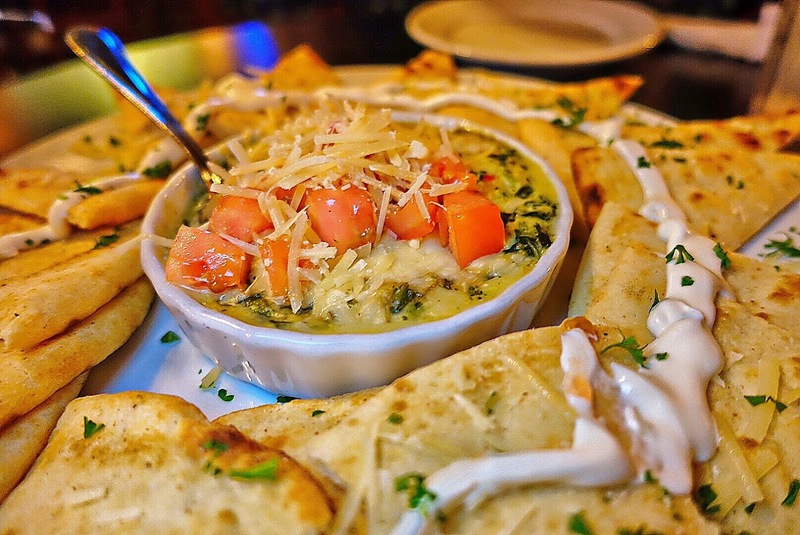 We also got the Spinach and Artichoke dip. SO good! I ate WAY too much of this. The snacks at Molly McPherson's were some of my favorite food on the trip. I'll definitely be back on my next trip for a drink and some food. 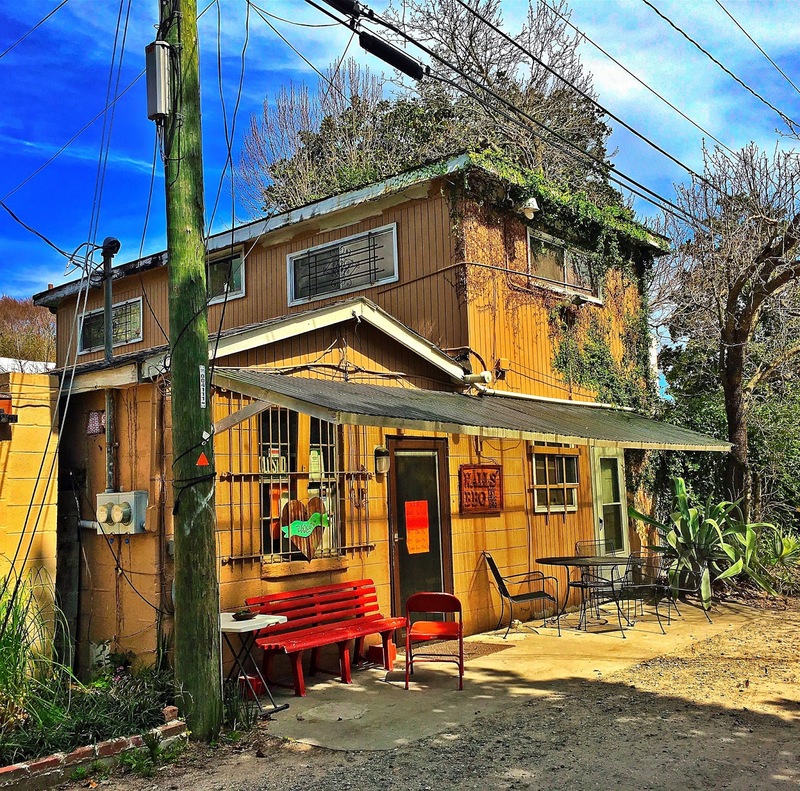 Jen's and Friends is definitely the most fun drinking spot in Savannah. 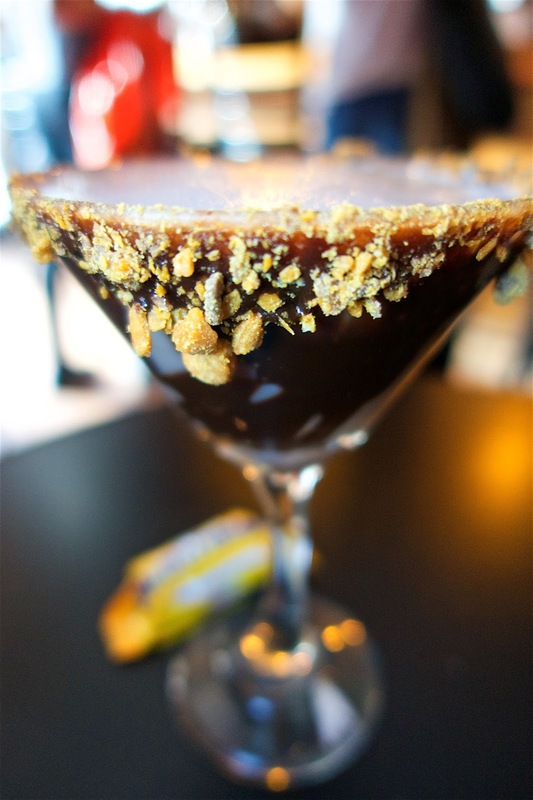 They have SO many fun martinis to choose from. 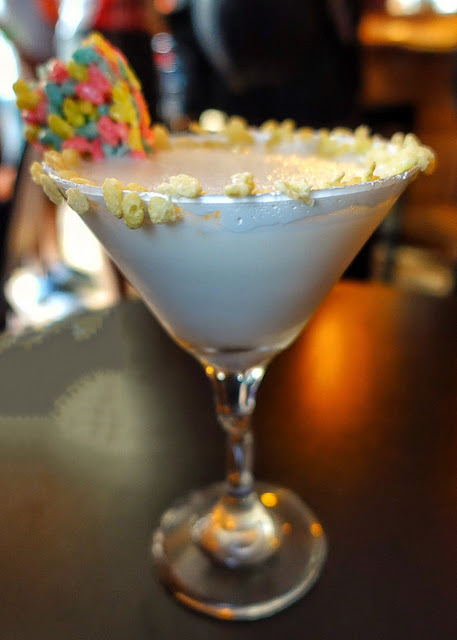 and the Rice Krispie martini. Can't wait to go back and try some of the other flavors! They have over 300 flavors to choose from! 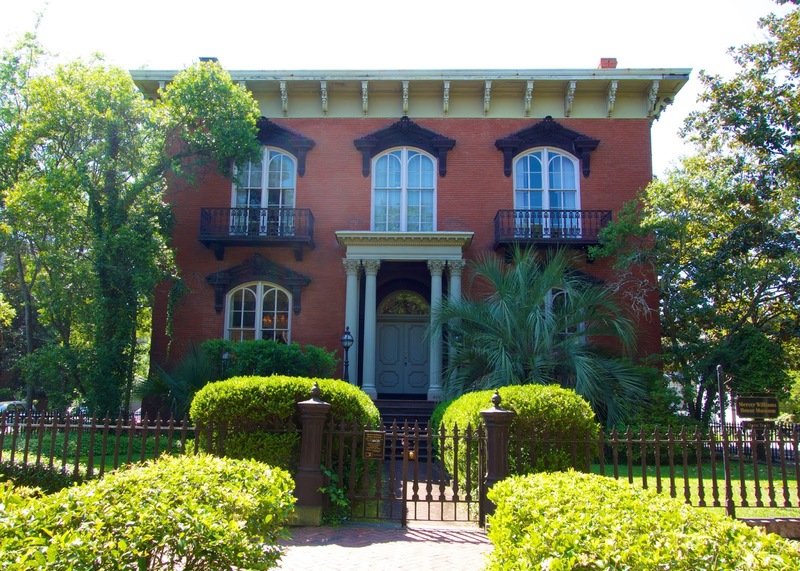 The purpose of our trip to Savannah was to see Lady Chablis. I've always wanted to go to her show and Chicken Legs wouldn't go with me. Karen and I had a BLAST! This was my first drag show, and it was SO much fun! Lady Chablis doesn't really perform. She came out and sang for a minute and then sat down and talked/entertained the crowd. She was hilarious. 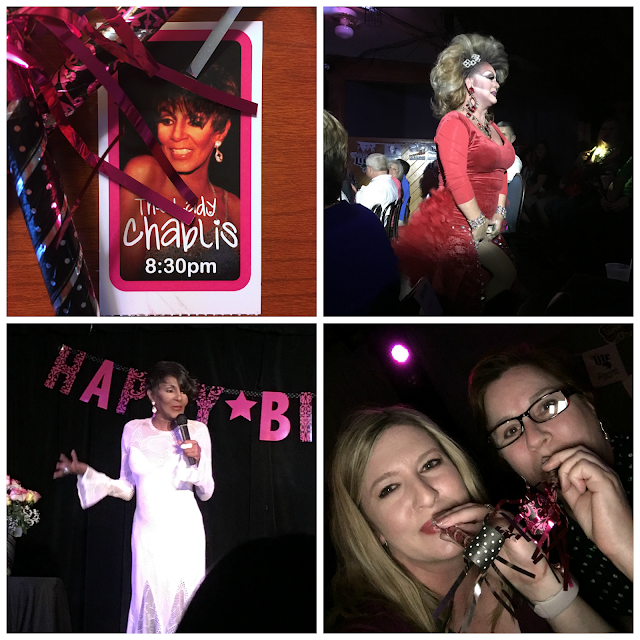 There were 5 drag queens that performed in addition to Lady Chablis. There was one drag queen that really stood out - she wore a thong! OMG! The show lasted about an hour. It was a lot of fun. After the show we stopped by Vinne Van Go Go's for a slice of pizza. Thankfully there wasn't a long wait. 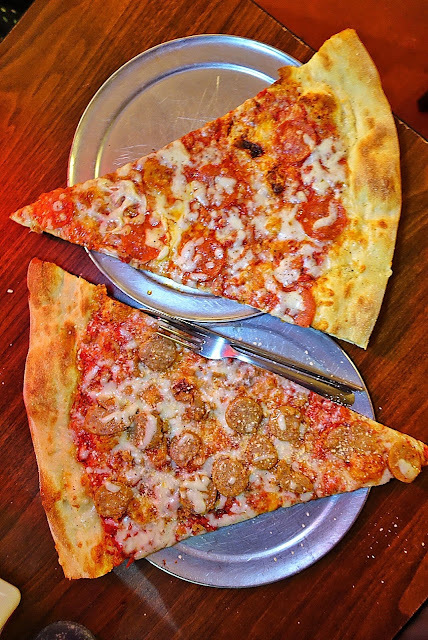 The slices are HUGE! Notice my fork and knife in the photograph. Vinne Van Go Go's also sells whole pizzas. Just a note - they only take CASH! 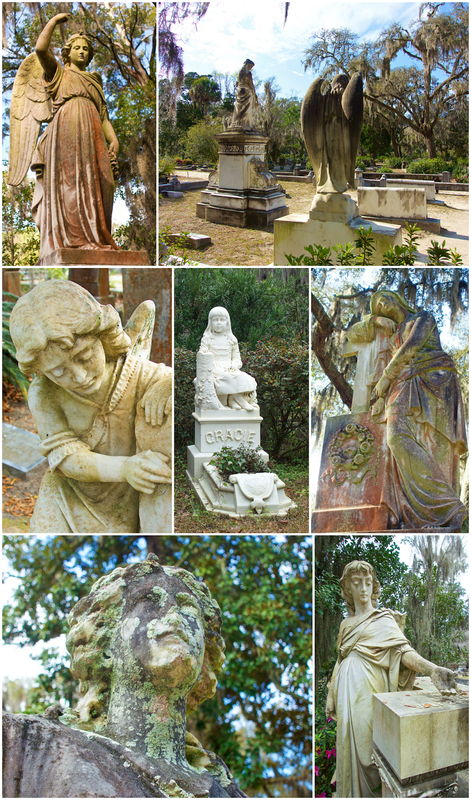 The next morning we drove out to Bonaventure Cemetery. 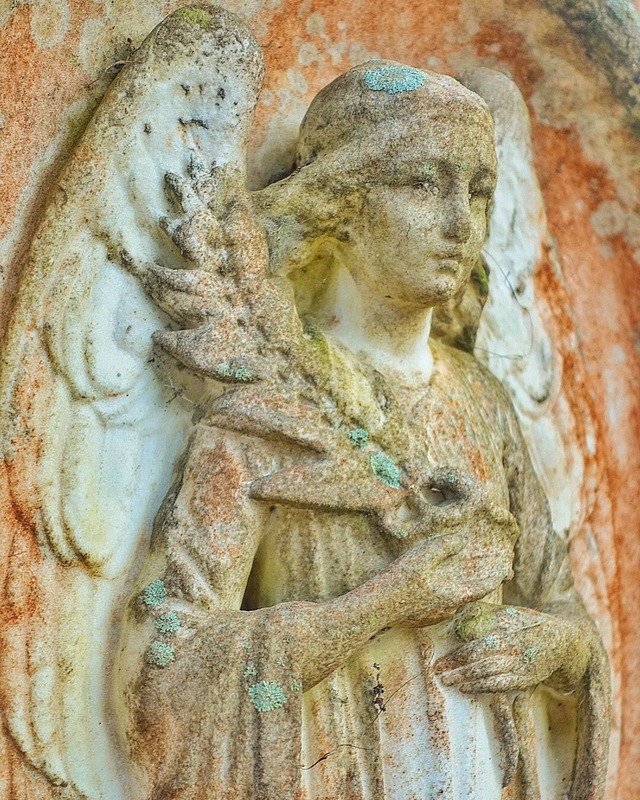 We spent a few hours searching for the best angels in the cemetery. We got there early and it wasn't crowded at all. It started filling up with people by the time we left. One of my Instagram followers suggested that we try Treylor Park while we were in town. I checked out the menu and it looked like SO much fun! 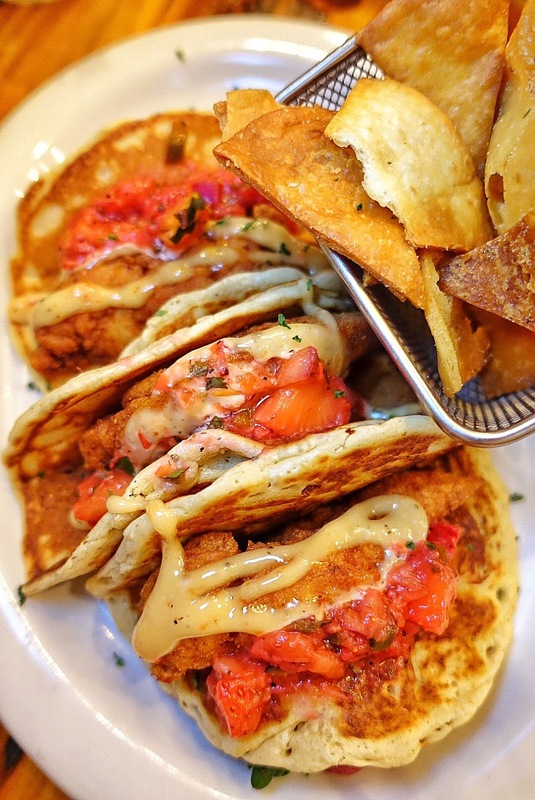 These are the Chicken and Pancake Tacos. Fried chicken tenders, topped with a honey chili and strawberry salsa served in pancake taco shells. For our side, we got the homemade chips. These were ridiculous! I am definitely going to recreate this at home. 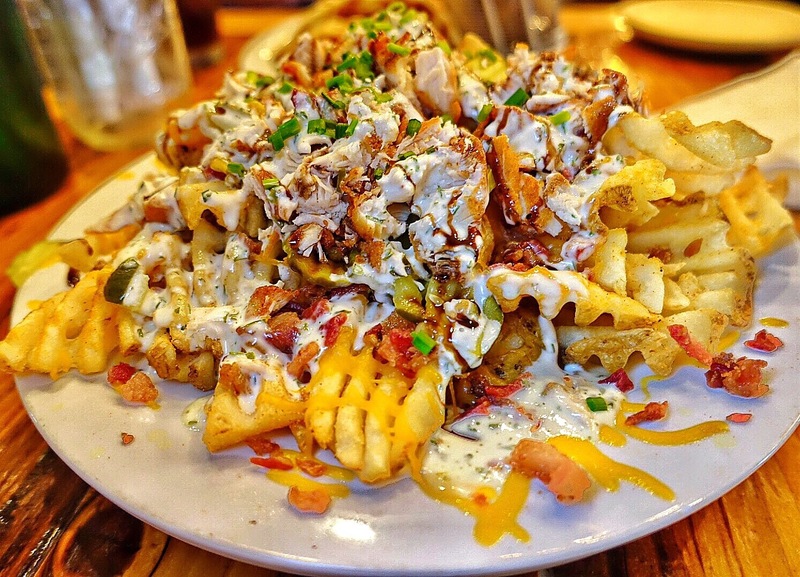 For our second entree, we got the Treylor Park Grande Nachos - waffle fries topped with cheddar, bacon, fried chicken, pickles, chive ranch and balsamic. Incredible! I wish I had a plate of these right now! 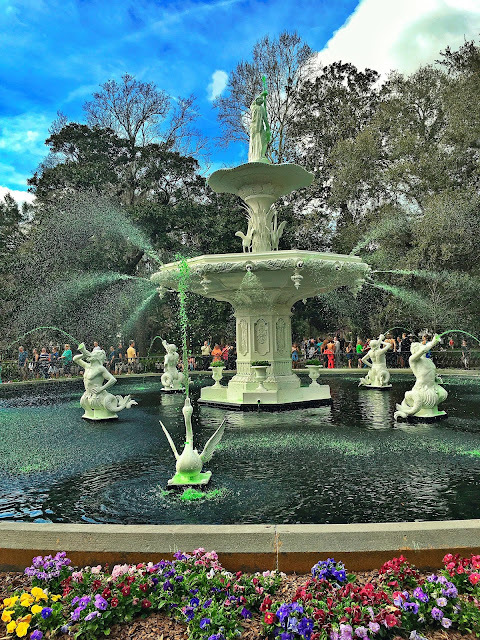 They had dyed the fountain green for St. Patrick's Day! 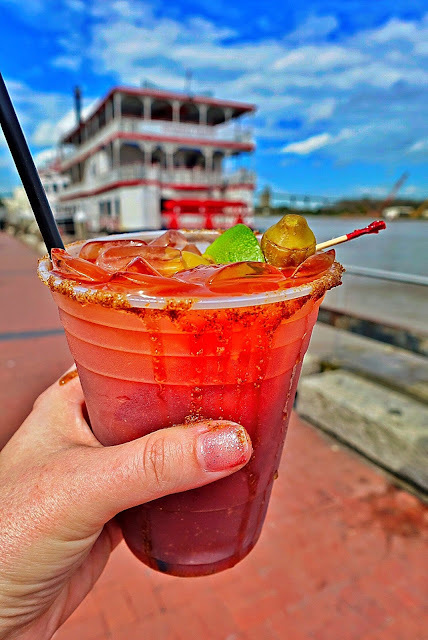 My friend, Mike, said that Bernie's had the best Bloody Mary's in town. He had to check it out. 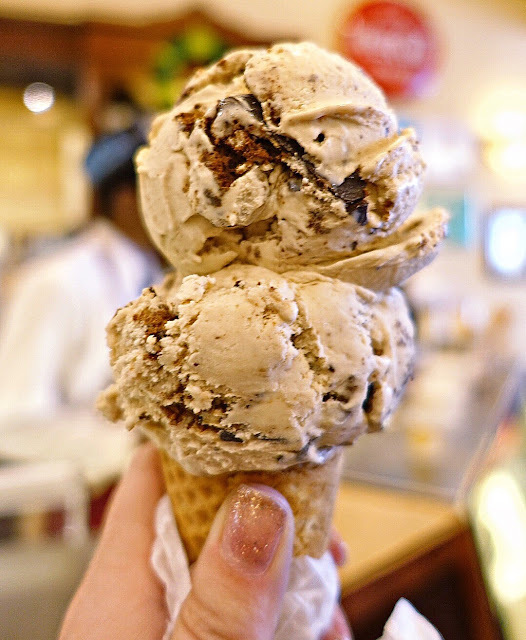 No trip to Savannah is complete without a stop at Leopold's for some ice cream. There is always a line, but it moves quickly. I got the limited edition Thin Mint and Cream in a sugar cone. Dinner was at The Olde Pink House. We didn't have a reservation, but we got lucky and snagged a couple of seats at the bar downstairs in The Planters Tavern. 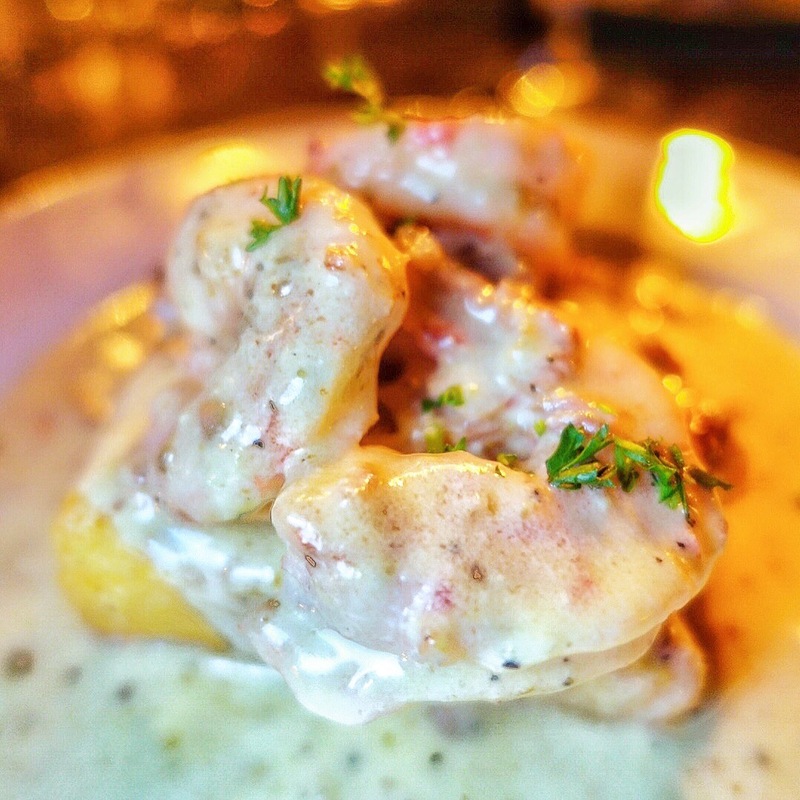 The Shrimp & Grits were some of the best we've ever eaten. It is on the appetizer menu - don't miss it! Our last stop of the evening was at the Grand Bohemian Hotel rooftop bar - Rocks on the Roof. 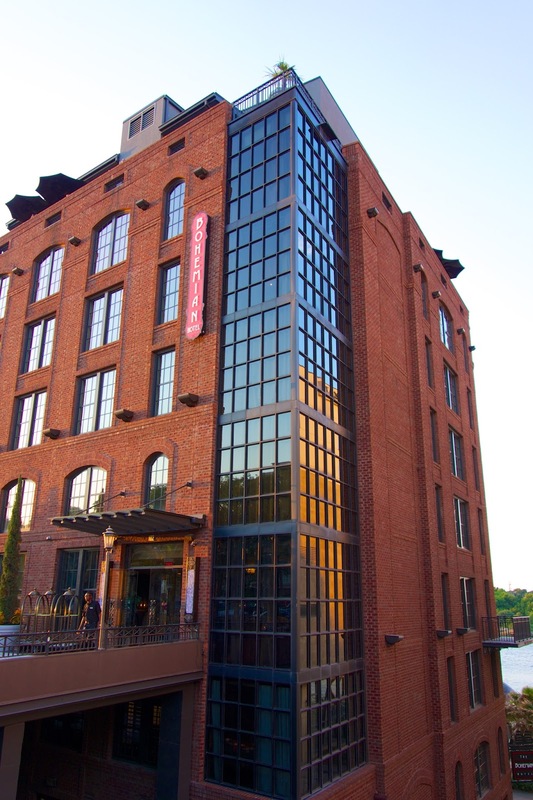 This is the best place to watch the sunset over the river. We didn't make it for sunset. 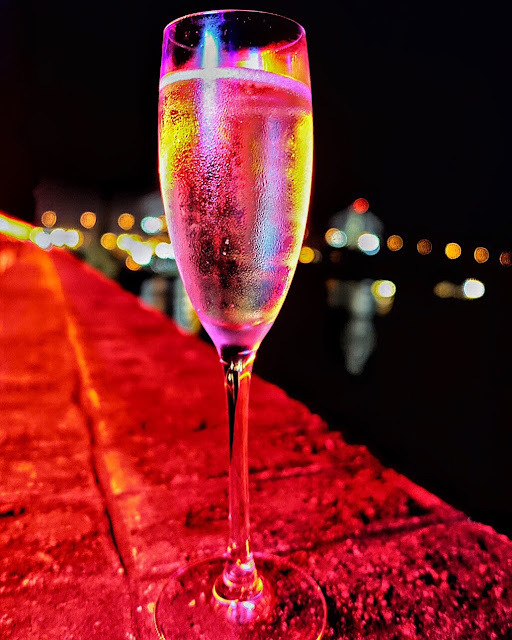 We had a glass of prosecco and enjoyed the perfect weather. 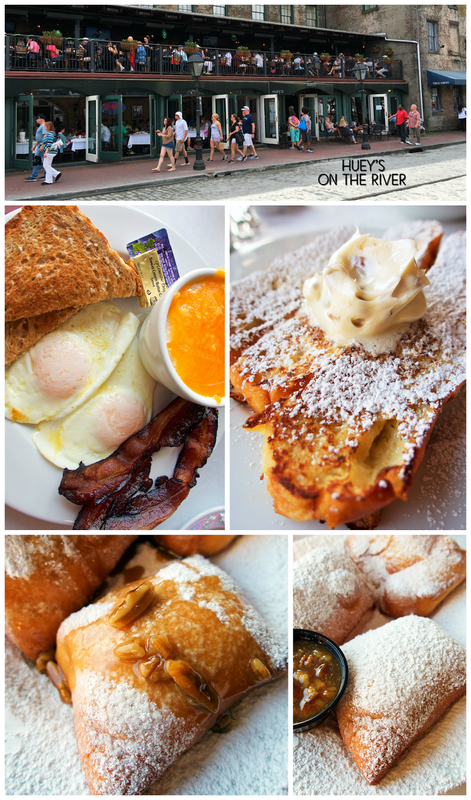 Our final stop in Savannah was at Huey's on the River for breakfast. We couldn't pass up the Beignets with Praline Sauce. Crazy good! Karen got the Pain Perdue (French Toast) with Praline Butter. It was melt in your mouth! I got eggs, toast and bacon with cheesy grits. YUM! I am dying to go back for lunch or dinner. LOVE cajun food!! 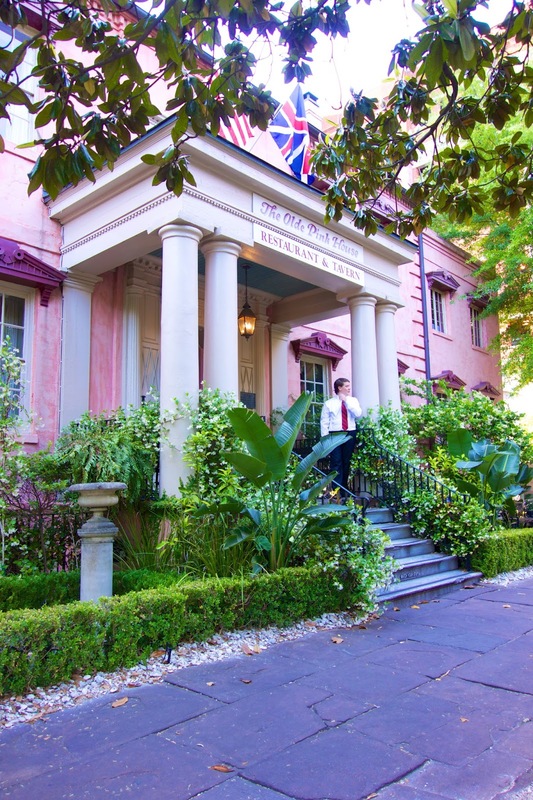 What is your favorite place in Savannah?? Where should we go on our next trip? Looks like a lot of fun! 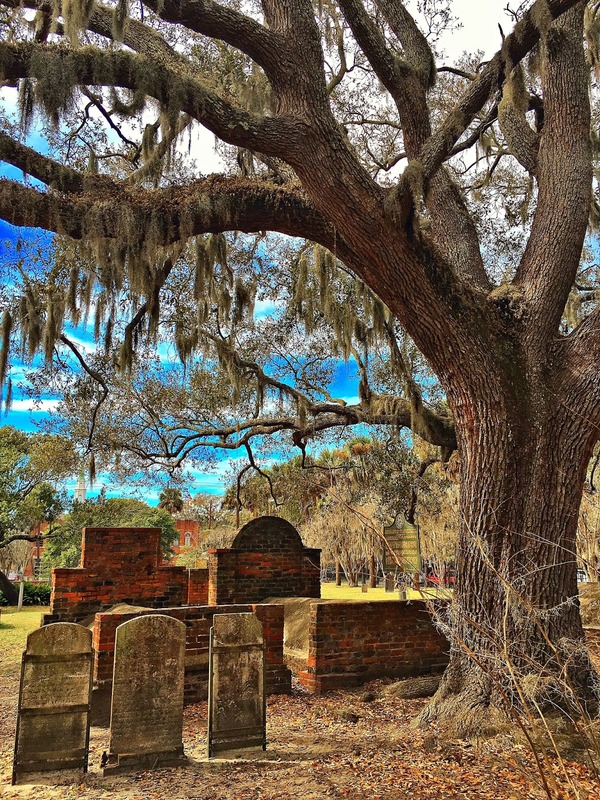 I would love to go to Savannah.